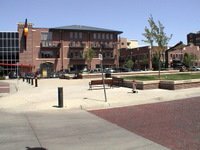 Driving through eastern Kansas near lunchtime, we decided to stop in Old Town Wichita. We were several days into our road trip and had no desire to grab another forgettable meal at a fast food joint. After missing our exit, we backtracked and got off the freeway in Old Town. All we knew was that this was a revitalized warehouse district with some good places to eat. The original brick buildings remain, but they've been reclaimed by restaurants and art galleries. 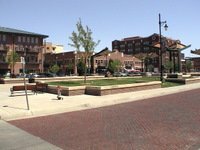 If you're an architect, or an architecture aficionado, definitely check out what they've done with Old Town Wichita. This is a great example of...revitalization? New Urbanism? Something good. 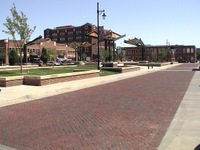 It seems many of these buildings are a result of the railroad boom that gave birth to the city of Wichita in the 1870s. They probably held boxes of food and basic household staples at some point. There's a grassy common area in the middle where we sat and stretched out in the....well, muggy July air. But it was nice to get out of the car and sit still for a while. This is a good spot to let the kids run around and let off some steam. A huge movie theater. This struck me as a good date spot. 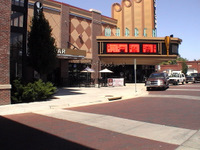 There's a roomy parking garage, many places to eat, and the theater. It was a bit tempting to go in and see some random flick in a nice, cool theater, but we had a lot of miles yet to cover that day, and a 15-month-old with us. We got to Old Town just after the traditional lunch hour and could tell that the Italian restaurant we chose had been busy. Employees were scurrying to bus all the tables. After a very satisfying pizza-and-salad lunch, we hit the highway towards Fort Scott. 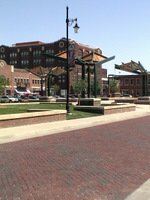 Next time your road trip leads you through Kansas on U.S. Route 54, make a stop in Old Town Wichita. As long as you avoid the lunch rush, you'll have a nice, relaxing meal and walk. You can even take in a movie before you continue your journey.